Go on, exult with me ... I have a place to play! Sunfish is my first quilt started after getting the sewing room ready enough to go that I could actually tackle projects in it. Jacob was right -- I needed a space to call my own. 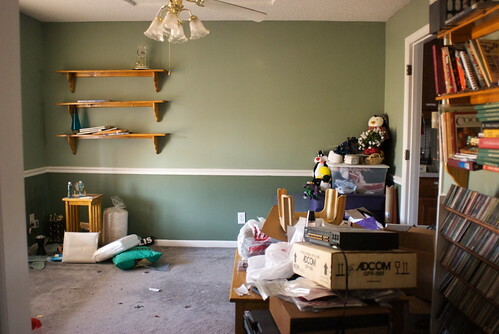 If Jeff could have a computer room, I could have a sewing room. 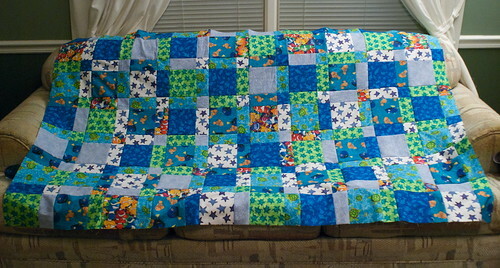 It was done for Beth and Ian's first child, Liam, who by all reports is well into his second year of using his quilt, beating it up, spilling things on it, sleeping under it, and having it tossed in the wash when it needs a good scrub. In other words, exactly what a kid quilt is supposed to do! Beth and Ian are expecting their second child, gender intentionally unknown, in September, and when she and Annie brought over weekend food for one of Jeff's visits, I plopped out lots of fabric on the living room floor and encouraged her to pick what she liked. She gravitated to blues and yellows, and that gave me an excuse to dig up some pieces of Mark Lipinski's "Califon" fabric series, which I loved but had never had an excuse to work with. 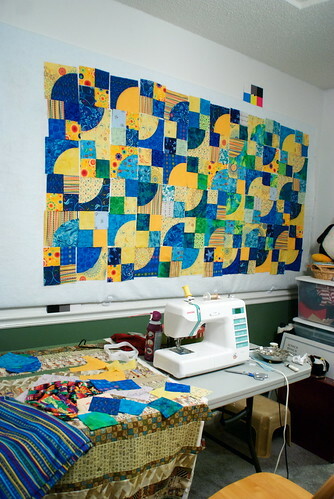 I usually try not to make quilts from just one fabric line, and this one incorporates stash fabrics, some of Jeff's hospital gowns, old scraps, the bug backing from 'Serendipity,' and other happy things -- but there are indeed several fabrics from "Califon," just because it was a bright, cheery, blue-and-yellow fabric set. Match the tools to the job, etc. It has been a joy to work on this quilt top while I've taken a couple of days off of work. 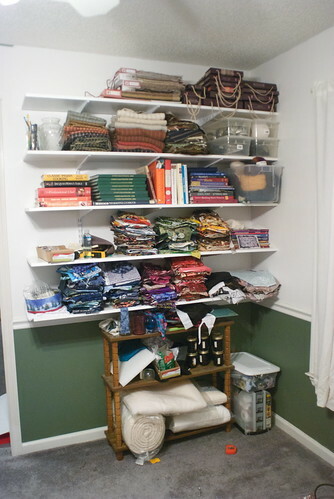 The sewing room isn't done, not by a long shot, but it has reached a useful state, and today was the first day I've ever experienced the pleasure of taking quilt blocks into my SEWING ROOM and putting them on my DESIGN WALL. To, you know, THINK ABOUT. "Is this right?" "Should this piece go over here, instead of over there?" Makes photography so much easier, too. 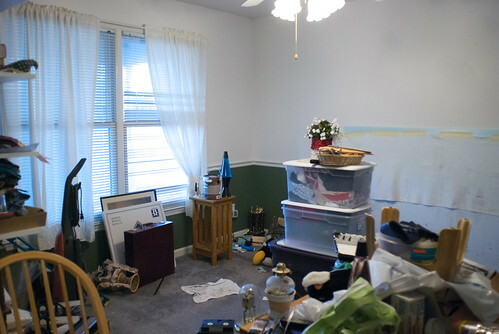 Admittedly, I need to get the CDs and the coffee table cleared out, and I need to set up better lighting, and I need to get my final table setup chosen, and I need to get a better chair ... blah blah blah. It'll come, in time. For now, though, I think I'll just savor being able to work on a project this quickly and easily. I'm starting to log some of the baby quilts that have come up recently, so my to-do list is swelling again, but I think I stand a chance of finishing this one (and 'Fledgling,' which I haven't talked about yet) before the baby actually arrives.